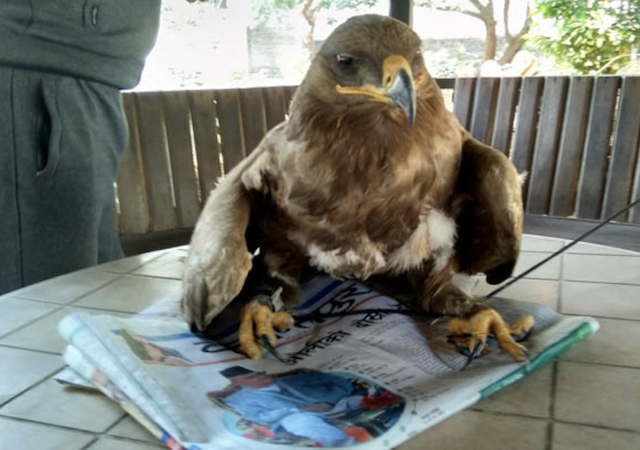 Children found the Mongolia golden Eagle grounded in a field, and called police when they spotted equipment strapped to its back and a metal ring around its leg with the inscription: oxnith.lab, nst.biol,mongolia 271. 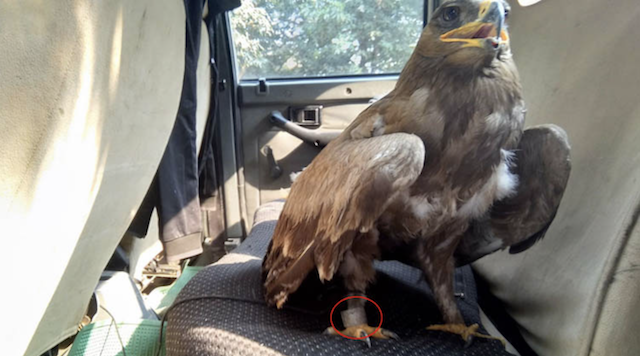 Police have sent the eagle to the District Forest Office, where head Dirgha Koirala said his office was investigating the radio transmitter that was equipped with a small solar collector. Nepal’s foremost ornithologist, Hem Sagar Baral explained that this species of endangered Golden Eagle usually migrates from Mongolia across the Himalaya to Nepal every winter enroute to Africa. He said the radio transmitter was probably installed by Mongolian conservationists to study the bird’s habits and migratory path. 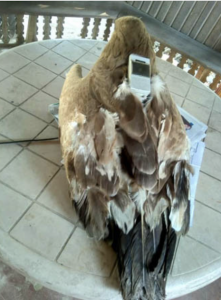 Regarding the eagle with the transmitter, the reason it might not be doing so well is because of the transmitter that is strapped to its back. Same as mobile phone towers and mobile phones that are making humans ill, the transmitter on the eagle would be giving off radiation constantly, day in and day out. Because it is attached to the bird, it would never have a reprieve from these signals. The safety code for these devices are based on thermal heating of a large human. Smaller animals are not covered under the safety code as they cannot thermally regulate themselves the same as a human being. No thermal health effects are not being considered at all. Please take this transmitter off this eagle and give it a chance at having a normal rest of its life.